The Panama Canal is the vein that connects two oceans – the Pacific and the Atlantic. It is one of the largest and most daring engineering projects ever undertaken! Since its opening in 1914, it has been traversed by over 800,000 vessels and it has become known as one of the seven wonders of the modern world. It is innovative because of its facilitation for maritime trade, as well as its length – the entire canal spans 48 winding miles. The concept of allowing ships to pass between two oceans stretches as far back as the 16th century. The King of Spain proposed a canal that would cross over the Isthmus of Panama, allowing for easier voyages of ships between Spain and Peru. In 1881, his dream started to become a reality. The French began to construct what would someday be known as the Panama Canal, but their efforts were cut short by disease and toil in the rain soaked tropics, as well as financial difficulties. In 1904, under President Theodore Roosevelt, the United States bought the unfinished canal for $40 million. Construction was completed in 1908. 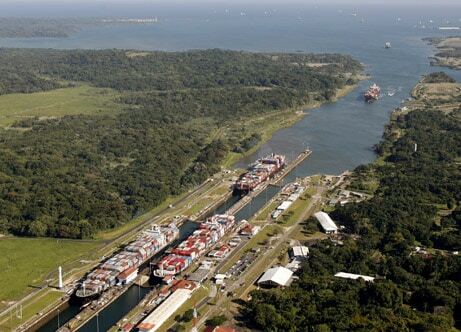 The Panama Canal is currently undergoing renovations to better handle the world’s biggest ships. This construction project is expected to be completed in 2015. Thanks to fluorescent lighting, the canal began operating 24 hours a day starting in 1963. The average sea level for the Atlantic and Pacific entrances are the same. Ships traveling between New York and San Francisco save over 7,500 miles by using the Panama Canal.